ISLAMABAD - Pakistani President Asif Ali Zardari thanked Chinese Premier Wen Jiabao and the Chinese government and people for their generous assistance of an additional $200 million in aid for flood victims, presidential spokesman Farhatullah Babar said on Friday. China pledged another $200 million of aid to flood- stricken Pakistan at the United Nations summit in New York on Wednesday. 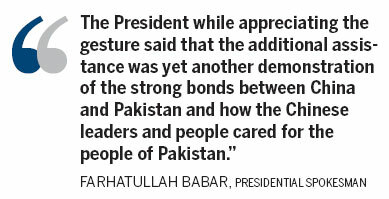 "The President while appreciating the gesture said that the additional assistance was yet another demonstration of the strong bonds between China and Pakistan and how the Chinese leaders and people cared for the people of Pakistan," the presidential spokesman said in a statement. He said the Chinese government had also provided medical, food and other supplies to the affected people of northern areas of Gilgit-Baltistan after landslide, which had affected thousands of people a few months ago. Huang Xilian, spokesman of the Chinese embassy in Pakistan, told Xinhua that with the announcement of additional assistance of $200 million, the total China's aid to the flood-hit Pakistan reached $250 million, its largest-ever humanitarian aid to a foreign country. He said China will provide the unconditional aid in accordance to the need of Pakistan to help with flood rescue efforts, relief and reconstruction. China was one of the first countries to provide aid to Pakistan in the immediate aftermath of the historic floods that have affected a significant part of the country since late July. The first batch of aid from the Chinese government, decided on Aug 1, was given to Pakistan on Aug 4. Social organizations, enterprises, individuals from China and the Chinese people in Pakistan have been voluntarily lending a helping hand to the Pakistani people by making donations in cash or in kind. China sent two international search and rescue teams to the worst-hit Thatta district in southern Sindh, and the Chinese army sent a 68-member medical team to Sehwan of Sindh and a 64-member rescue team with four helicopters to Hyderabad. Huang said it is the first time that China sent out overseas so many rescue and medical teams in its history, and it is the first time that Chinese military helicopters have carried out an overseas humanitarian rescue and relief mission. It is also the first time that China has sent a large amount of aid to its neighbor using a land route, as 101 Chinese trucks reached Sust Dry Port via Khunjerab Pass by land on Sept 1, loaded with daily necessities including flour and oil for the stranded people in Hunza area, north Pakistan. The two-month flooding along the Indus River in Pakistan has killed almost 1,800 people and left millions homeless. China will continue to closely follow the flood situation and provide further support to Pakistan, the embassy said. A group of photos showing quadruplets thriving after six years. As China moves towards being the center of potato production in Asia, the humble potato is now bringing wealth to some. Kate Moss arrives at the memorial service for Alexander McQueen. Chinese singer Li Yuchun, also known as Chris Li, shot a series of photos for the 'Pink Ribbon' activity. Many of us struggle to find real happiness. Why is that? Will the world achieve food security?